Bruce Lee fans! If you are in Los Angeles, Visual Communications invites you to a unique celebration of Bruce Lee's 75th Birthday. Join us for a screening of the documentary In His Own Words, then sit in on an intimate conversation with Bruce's daughter Shannon Lee and his god-daughter Diana Lee Inosanto, followed by a celebration with live performances, special guests, a silent auction, food and beverages and more. It's happening Sunday, November 15 at the Japanese American National Museum. Visual Communications invites you to join us for a unique celebration of Bruce Lee's 75th Birthday. Start the evening with a screening of IN HIS OWN WORDS followed by an intimate conversation with Bruce's daughter Shannon Lee and god-daughter Diana Lee Inosanto as they reflect on Bruce's impact in their own lives and his continuing legacy worldwide. 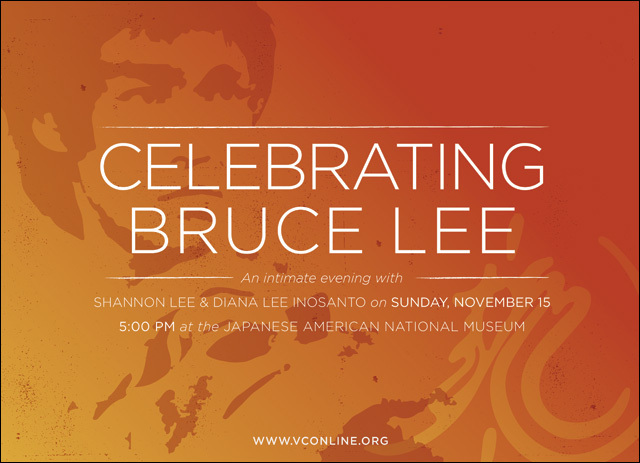 After the conversation, the celebration continues in the Aratani Central Hall at the Japanese American National Museum with live performances, special guests, a silent auction with unique Bruce Lee items, delicious appetizers, bites and beverages. I have the honor of moderating the conversation with Shannon and Diana. I hope you can join us. This event will have limited seating, and tickets are gonna go! Because, come on, everybody is a fan of Bruce Lee. So mark your calendars, order your tickets online and I'll see you there. Proceeds from the event will support programs at Visual Communications, whose mission is to develop and support the diverse voices of Asian American and Pacific Islander filmmakers and media artists. For further information about the event, visit the Visual Communications website.